O’Malley (nee Pepper) Springfield, Tipperary Town and formerly of Victoria, B.C., Canada, April 19th 2018, peacefully surrounded by her loving family in the care of the wonderful staff of Milford Care Centre, Limerick. Dawn, daughter of the late C.J. Beloved wife of Jim and cherished mother of Tara, Erica, Tracey and David. Sadly missed by her loving family, mother Marion, sisters Pat, Julie and Fern, grandchildren, sons-in-law, extended family and friends. Reposing at Whelan’s Funeral Home, Bansha Road, Tipperary on Saturday evening, from 5pm with Removal at 7.30pm to St. Michael’s Church, Tipperary. Requiem Mass on Sunday at 12.30pm and funeral afterwards in St. Michael’s Cemetery, Tipperary. Pre-deceased by his son Michael. Sadly missed by his wife Alice, son T.J., grandchildren Shakera, Andrew & Stephen, great-grandchildren Michael, Isaac and Harvey, brother, sisters, daughter-in-law Alice, carer Bridget, nephews, nieces, extended family and friends. Reposing at Condons Funeral Parlour, Clonmel on Saturday evening from 5.00pm, with removal at 7.30pm to St Michael’s Church, Clerihan. Funeral Mass on Sunday at 12 noon followed by burial in the adjoining cemetery. Peacefully, in the excellent care of the Staff of Our Lady’s Manor, Dalkey. Beloved wife of the late John and predeceased by her son Michael. Deeply cherished by her children Geraldine, John, Eugene, Pauline & Eimear, daughter- in-law Lisa, sons-in-law Gerry & Michael, Eugene’s partner Anne, grandchildren Peter, Mark, David, Daniel & Jack, sisters-in-law, nieces, nephews, relatives & friends. Funeral Mass on Saturday April 21st. in Our Lady Queen of Peace, Merrion Rd., at 10 am., followed by burial in Holy Cross Cemetery, Charleville (arriving 3pm approx). No Flowers Please. Buckley (nee Ryan) (Kyle, Tipperary and formerly of Gurtnegeara, Doon) April 18th 2018, peacefully at her residence Ciss (Sarah), wife of the late Pat; Sadly missed by her loving daughters Bernadette, Maria and Bridget, sons Michael, John and Patrick, daughters-in-law, sister-in-law Julia, grandchildren, great-grandchildren, nieces, nephews, relatives, neighbours and a wide circle of friends. Reposing at her residence Friday evening from 5 o’c until 8 o’c. Arriving in St. Nicholas’ Church, Solohead Saturday morning for Requiem Mass at 11.30 o’c and burial afterwards in Doon Cemetery. Peacefully in the wonderful care of the staff of Rushmore Nursing Home, Galway. Sadly missed by his loving brothers Anthony (Tony), Niall, and Paul, sisters Erina and Dervilla, brothers-in-law Edwin and Seamus, sisters-in-law Rachel and Margaret, nephews, nieces, grandnephews, grandnieces, relatives and friends. Reposing at Condons Funeral Parlour, Clonmel on Friday evening from 5.30pm, with removal at 7.30pm to SS Peter & Paul’s Church. Funeral Mass on Saturday at 11.30am followed by burial in St Patrick’s Cemetery. Peacefully in the exceptional care of the management and staff of Ashlawn Nursing Home, Nenagh. Predeceased by his beloved wife Kathleen. Deeply regretted by his cherished daughter Paula and grandchildren Steven and Kayla, son-in-law Alex, sister Maisie, his many nephews and nieces, relatives, old neighbours and friends. Reposing at Ashlawn Nursing Home (E45 FA31) this Saturday from 5 o’c with removal at 7 o’c to arrive to Silvermines Church at 7.30 o’c. Requiem Mass on Sunday at 11 o’c followed by burial in Kilmore Graveyard. Predeceased by his parents, son Seamus and brother Joby. 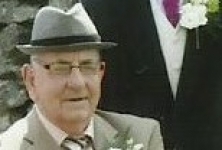 Deeply regretted by his loving wife Mary, son Richard, daughter Caitriona, grandsons Aaron and Gus, grand- daughter Niah, his daughter-in-law Kelly, brothers Michael and Tommy, sisters Kathleen, Josie (Muckalee/Ballyfoyle), and Maureen (Johnswell, Kilkenny), nephews, nieces, relatives, neighbours and large circle of friends. Reposing in Ronans Funeral Home, Ballingarry on Friday April 20th from 5pm to 7pm followed by Funeral Prayers. Removal on Saturday morning to the Church of the Assumption, Ballingarry for 11.30am Funeral Mass. Burial afterwards in the adjoining cemetery. Paschal O’Connell (Flannan Street, Nenagh) April 18th 2018. Predeceased by his brothers Bob, Mick ( Mixer), Benny, Stephen and Sean. Deeply regretted by his loving sister Nell, brother-in-law Mick, nephews, nieces, relatives and many friends. Reposing at Keller’s Funeral Home, Nenagh, on Saturday evening from 6pm to 7.30pm. Funeral arriving to St. Mary’s of the Rosary Church, Nenagh, on Sunday morning at 9.45am for Funeral Mass at 10am, followed by burial in Cloughprior Cemetery. Family flowers only donations if desired to “Mo chara animal rescue“. Dariusz Leszczynski, Ballyanny Upper, Nenagh, April 17th 2018, suddenly. Deeply regretted by his loving wife Iwona, son Marcin, daughters Natalia and Julia, mother Janina, brother Tadeusz, sisters Lydia and Alicia, brothers-in-law, sister-in-law, nephews, nieces, relatives and many friends. Reposing on Saturday evening at Keller’s Funeral Home, Nenagh, from 3 o’clock to 5 o’clock. Funeral arriving to St. Mary of the Rosary Church, Nenagh, on Sunday for funeral Mass at 4 o’clock followed by cremation in Shannon Crematorium.